This week Leslie of Lethally Delicious chose Dorie's Tarte Fine for TWD and I'm so, soooo grateful. Not only was it delicious it is one of the easiest recipes ever! You see we're moving house on Thursday and chaotic doesn't even begin to describe the state of our place at the moment. Apart from almost everything in the kitchen being packed already there is barely a clear surface to put a pan down on. So a recipe that calls for pre-bought puff pastry, a few apples, an egg and some sugar was heaven sent. This is one of those desserts that looks really impressive but takes literally minutes to prepare. In my case an extra 5 minutes was needed to hunt through a box for a pastry brush! In spite of all that I still managed to burn it (and then carefully crop that bit from the photo). Our oven has developed a nasty hot spot that will singe things into oblivion if you don't carefully turn the tray a few times during cooking. Which I of course forgot to do. Blame the pregnancy brain. Utter perfection. Flaky butter puff pastry topped with slightly tart apples and a crispy scattering of sugar. Delicious warm from the oven or at room temperature hours later with a big scoop of vanilla icecream. This time next week we will be all settled in our new home. Fingers crossed the new oven will be better than the old! You will find the Tarte Fine recipe at Lethally Delicious. Thanks Leslie! Yours is the first post I've seen and I'm so glad you loved it and it fit into your move. It looks gorgeous (I'm going to remember your strategic cropping tip!) Thanks for baking with me this week. Looks good Susan - so glad that you could fit it in. Good luck with the move!!! Good luck on your move. We are in the middle of a remodle project that includes the kitchen, I do feel your pain. But I will be baking this tonight! Your tarte looks so flaky and delicious. Good luck with your move. I have no idea how you even made this, in the midst of unpacking. You did a beautiful job, to top it off. It looks delicious! I am moving too on Saturday, so was glad to find a few-ingredient recipe. What perfectly lined up apple slices! Yours puts mine to shame. gotta love cropping, eh? ;) it looks beautiful!! Apple perfection...lovely! I loved this. A diamond in the rough. I agree so good warm with ice cream! I loved this one too! Your tart looks amazing! I love that you are moving and made them anyway. True TWD dedication! It looks amazing...reminds me of when I lived in Switzerland, they would make all their pies like that...yummy! Just started followin...check us out. Thanks for this post about a wonderful apple dessert. The picture is mouth-watering! This tart looks fantastic! 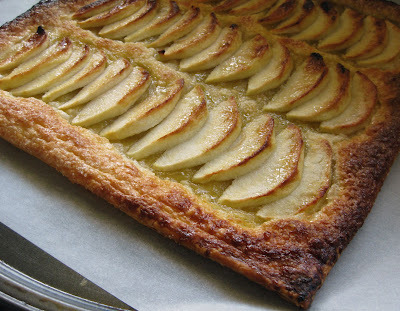 I just love the smell of freshly baked tarts especially with apples!